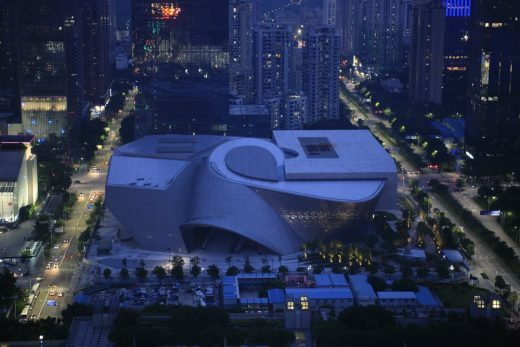 Latest photographs, taken by Duccio Malagamba, feature Shenzhen’s new cultural meeting point and a venue for architectural exhibitions. 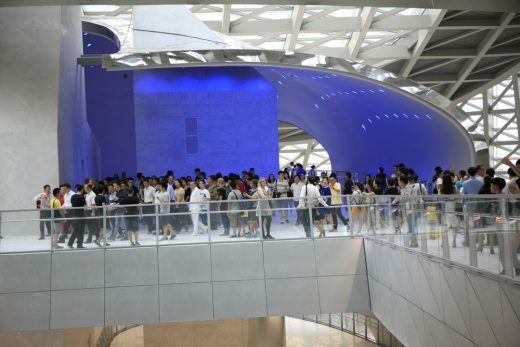 A grand ceremony to celebrate the completion of construction of the Museum of Contemporary Art & Planning Exhibition (MOCAPE) designed by COOP HIMMELB(L)AU Wolf D. Prix & Partner was held on Sunday, September 25 in Shenzhen, China. The event was attended by high officials and a big crowd of interested visitors. It was held in a relaxed and enjoyable atmosphere. Speakers at the event included Mr. Wolf D. Prix, Design Principal and CEO of COOP HIMMELB(L)AU, government and companies’ representatives. 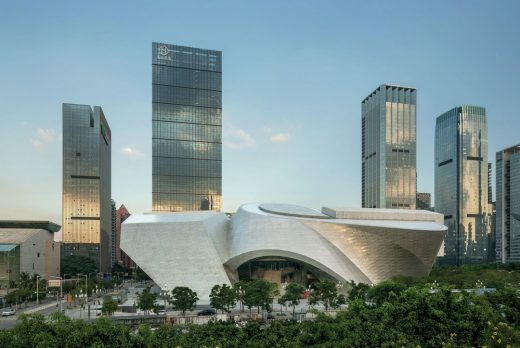 Clients’ representative, Mr. XU Chongguang, Head of Urban Planning Institute emphasized in his ceremony speech that he is very proud of the Museum Complex. 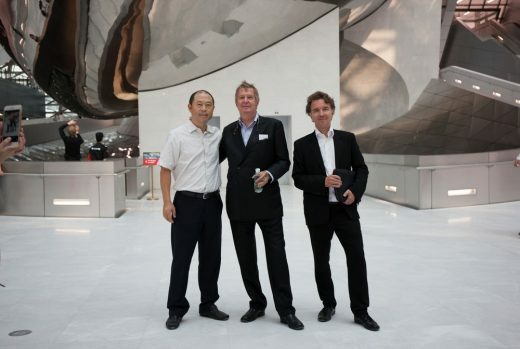 “Museum space is like a three-dimensional Chinese Garden” said Mr. Wolf D. Prix. 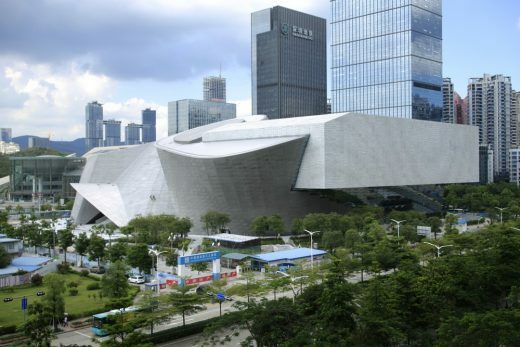 The Museum of Contemporary Art & Planning Exhibition (MOCAPE) is part of the master plan for the Futian Cultural District, the new urban center of Shenzhen. 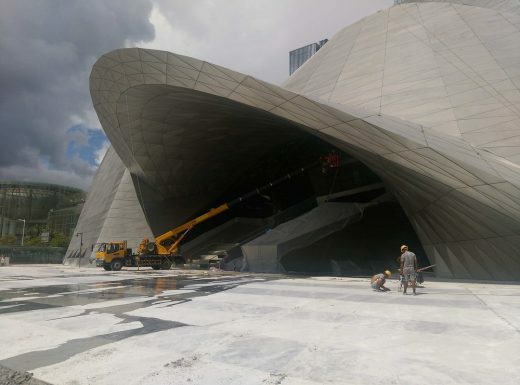 The project combines two independent yet structurally unified institutions: The Museum of Contemporary Art (MOCA) and the Planning Exhibition (PE) as a cultural meeting point and a venue for architectural exhibitions. 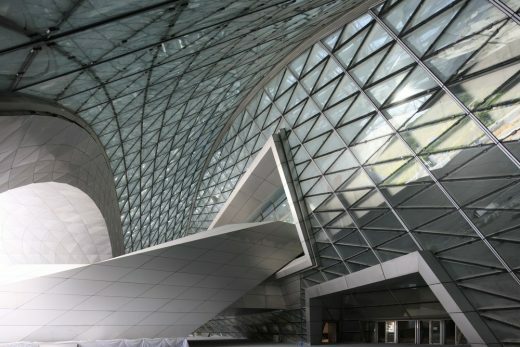 The lobby, multifunctional exhibition halls, auditorium, conference rooms and service areas will be used jointly. 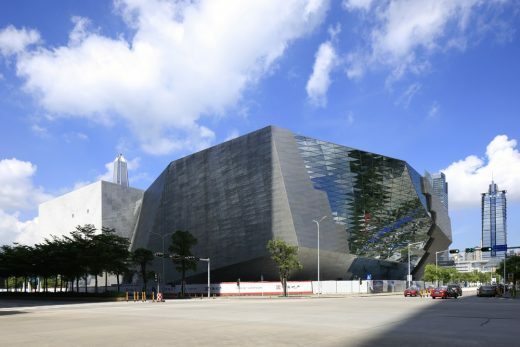 Both museums are designed as separate entities emphasizing their individual functional and artistic requirements and yet are merged in a monolithic body surrounded by a multifunctional facade. This transparent facade and a sophisticated internal lighting concept allow a deep view into the joint entrance and transitional areas between the buildings. 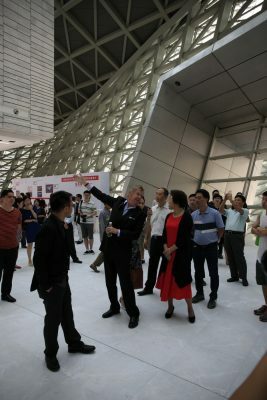 From the inside, visitors are granted an unhindered view onto the city suggesting they are somewhere in a gently shaded outdoor area, an impression enhanced by 6 to 17 meter high, completely open and column-free exhibition areas. 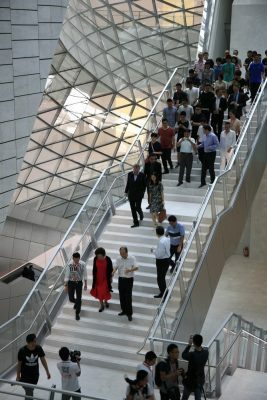 Behind the entrance area between the museums, visitors ascend to the main level by ramps and escalators and enter the “Plaza”, which serves as a point of departure for tours of the museums. From the Plaza the rooms for cultural events, a multi-functional hall, several auditoriums and a library can be accessed. A silvery shining and softly deformed “Cloud” serves as a central orientation and access element on the Plaza. 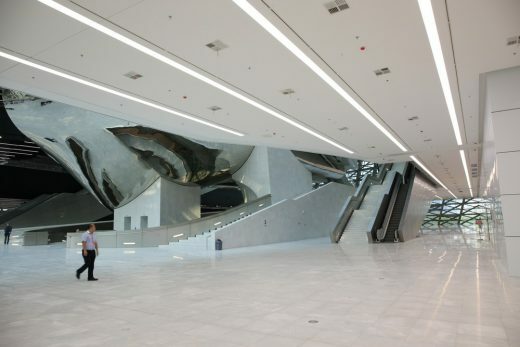 On several floors the Cloud hosts a number of public functions such as a café, a book store and a museum store and it joins the exhibitions rooms of both museums with bridges and ramps. 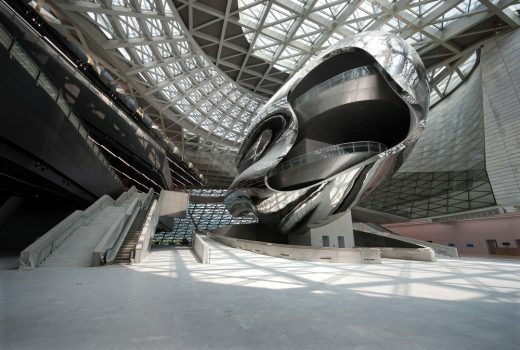 With its curved surface the Cloud opens into the space reflecting the idea of two museums under one roof. 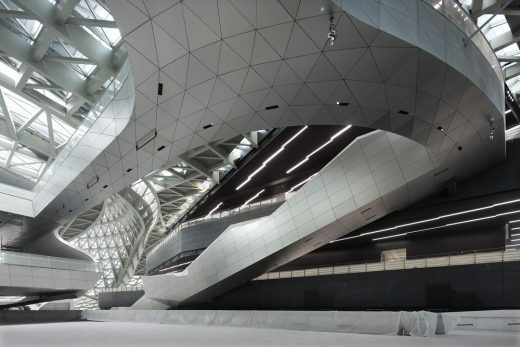 The MOCAPE monolith completes the eastern part of the master plan for the city center and fills the last gap in the Futian Cultural District between the „Youth Activity Hall“ (YAH) to the north and the opera-library complex to the south. 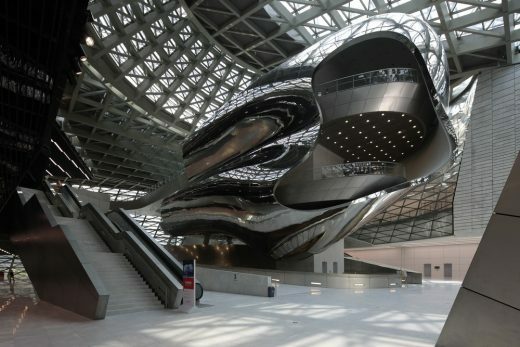 Similar to other buildings in this district, the main level of the MOCAPE lies 10 meters above the ground level and so creates a stage-like platform, which acts as a unifying element with the adjacent buildings. The exterior skin consists of an outer layer of natural stone louvers and the actual climate envelope made from insulated glass. 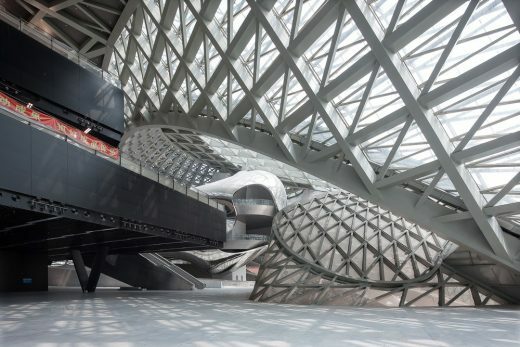 These elements form a dynamic surface, which is structurally independent from the mounting framework of the museum buildings. 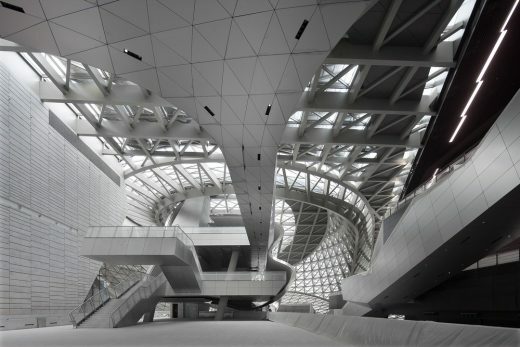 This functional exterior envelops the two museums, a vertical access and entertainment element (Cloud), the public Plaza, and the multifunctional base. The technical building equipment is designed to reduce the overall need of external energy sources: Pollution free systems and facilities use renewable energy sources through solar and geothermal energy (with a ground water cooling system) and only systems with high energy efficiency have been implemented. The roof of the museum filters daylight for the exhibition rooms, which reduces the need for artificial lighting. With this combination of state of the art technological components, a compact building volume, thermal insulation and efficient sun shading the MOCAPE is not only an architectural landmark but also an ecological and environmentally friendly benchmark project.